Atlantis and Seaworld Explorer are two submarines/semi underwater vessels. 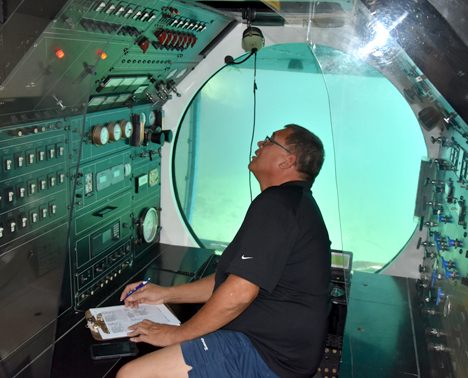 In 1986, Atlantis I began the world’s first tourist submarine operation in Grand Cayman. Atlantis started the School Children’s Program; classroom work is followed by a dive, which provides children with real exposure to the ocean environment, and an awareness of its fragile nature. Subsequently 48 passenger submarines were launched across the Caribbean including, Aruba. Atlantis built and deployed a series of reef structures aimed at attracting and protecting numerous different marine life into an area that was previously scoured by a hurricane many years ago, removing the protective coral cover for marine life. Trainees working on this project will be based in the DePalm maintenance department working in the field of engineering and mechanics and will have the opportunity to work on both DePalm’s sea vessels and also their main site jeeps and tour vehicles. Shifts will mainly be in the evening and night approximately 18.00 – 24.00 when the vehicles are out of action and much of the work will be delivered underwater. Aruba is a 33 km-long island of the Lesser Antilles in the southern Caribbean Sea, located 27 km north of the coast of Venezuela and 130 km (approx.) east of Colombia. Aruba is one of the four constituent countries that form the Kingdom of the Netherlands, together with the Netherlands, Curaçao, and Sint Maarten whose citizens share a single nationality: Dutch citizen.Palm Island is located just off the coast in the quiet area of Balashi.